Homemade thank you cards can be a unique way to express appreciation for a special gift or a thoughtful gesture. Handmade cards can easily be created using basic crafting supplies and a little imagination. Try using one of the following designs to inspire your own individual thank you card creations. 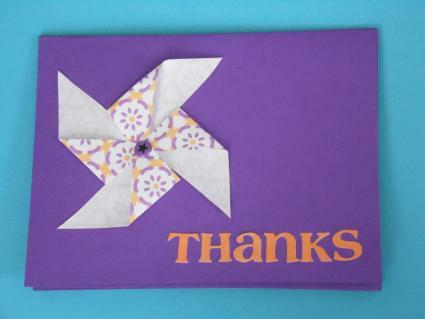 A pinwheel makes a playful embellishment for your thank you card. Cut a square of patterned paper to measure 4"x4". Fold the paper in half diagonally. Unfold. Fold in half along the other diagonal. Unfold. Use the creases you've made to cut towards the center line. Stop about 1/2" from the middle. Fold alternating ends of the triangle flaps in towards the middle to create a pinwheel shape. Join together your pinwheel by threading the flaps through a decorative scrapbooking brad. Adhere the pinwheel to the front of your card with the glue stick. Use letter stickers to spell out "Thanks." Having children send thank you cards for the gifts they receive is an excellent way to teach gratitude and good manners. This colorful design is a project that is simple enough to make with your kids. 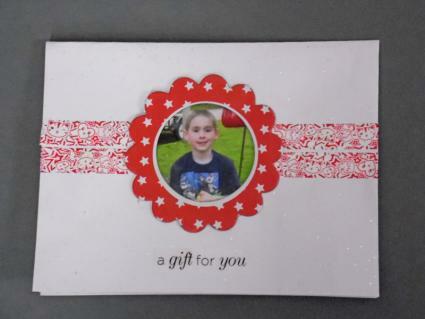 Washi tape is a decorative tape that looks a bit like ribbon but feels like paper. It has an adhesive backing which eliminates the need for glue. You can find washi tape at your local craft store or order it online. Apply different colors of washi tape in a random striped pattern to a sheet of scrap paper. If you don't have any washi tape, you can simply substitute strips of paper in the patterns of your choice and use a glue stick to create the pattern. Cut out the desired shape. This design uses a freehand heart, but you could also trace your child's hand print if desired. Glue the embellishment to the front of the card. Add the rub-on message as desired. Including a handmade gift with your thank you card can be a great way to show your appreciation. This card features a removable refrigerator magnet picture frame. Choose a picture that represents your reason for sending the card. If you're thanking grandma for buying your son a new shirt, take a picture of him wearing the shirt. If you're sending out thank you cards for a baby shower, include a picture of your baby or a fun candid snapshot from the party. Cut your photo to fit the frame. Secure it to the frame with double sided tape. Add magnet tape to the frame. Add washi tape to your card base. Again, you can substitute patterned paper if you don't have washi tape handy. Attach the frame by applying a small amount of double sided tape over your magnet tape. Add the saying to the front of your card with the letter stickers. On the inside, you can write a message that explains that the frame is a refrigerator magnet that should be removed. Paper Crafts has a free downloadable e-book with 30 different thank you and congratulations card ideas. It features the work of several different crafters, so there should be a project to suit nearly every sense of style. Real Simple has a list of 13 homemade thank you note ideas that you can make with your children. Many of these ideas could easily be used by adult card makers as well. 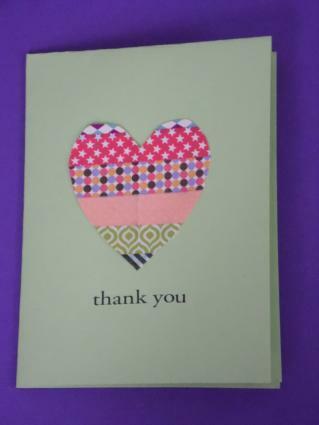 Better Homes and Gardens has a gallery of 27 different thank you card designs, using techniques such as rubber stamping, paper piecing, and embossing. In today's fast paced world, many of us skip sending out thank you notes because we feel like they need to be done immediately after a gift is given. Your card will still be appreciated even if it arrives a little late, especially if it's been lovingly hand-crafted just for the recipient. A heartfelt expression of gratitude is always welcome, regardless of when it arrives.